Surgeon General William A. Hammond founded the Army Medical Museum in 1862 to “document the effects of war wounds and disease on the human body.” Its staff has conducted pioneering research on infectious diseases, pathology, and medical techniques. Museum researchers “contributed to discovering the cause of yellow fever and developing a vaccination for typhoid fever.” The Army Medical Museum was designated a Registered National Historic Landmark under the Historic Sites Act of August 21, 1935. 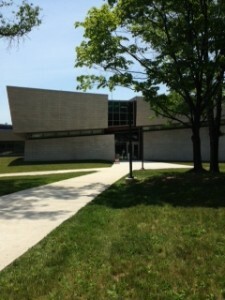 The National Museum of Health and Medicine is housed in its new facility in Silver Springs, Maryland. Originally located in the former Walter Reed Medical Center in Washington, D.C., the museum focused on army medicine and artifacts from the Civil War and subsequent world wars, including the wars in Vietnam and Korea. I visited the museum a few years ago in its former location and was struck about the lugubrious atmosphere, the smell of decay, mold, and formaldehyde. The museum today is modern and antiseptic, “dedicated to preserving, collecting, and interpreting the artifacts, specimens, photographs and documents that chronicle the history and practice of medicine over the centuries. The National Museum of Health and Medicine’s collection contains more than 25 million specimens, slides, photographs, artifacts, artworks, and documents that accumulated since 1862 after the “Army Medical Department ordered that ‘all specimens of morbid anatomy’ be gathered from Civil War battlefields.” Many specimens are kept in temperature-controlled storage in the wall to wall sliding bins and can be observed behind a huge glass enclosure. 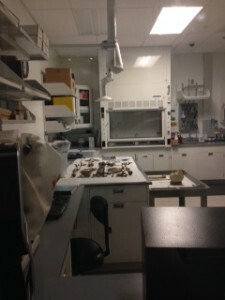 A forensic teaching laboratory, visible through large windows, contained skeletal remains and the tools necessary for identification. Instruments such as chisels, ossicle hooks, rotary burs, cerebral exploratory cannula, mastoid gouge, Volkmann’s spoon, periosteal elevator, searcher and scoop, retractors were Macewen’s instruments used in 1894 for brain operations. A few tools used by Surgeon General William A. Hammond (circa 1860) were displayed. During the Civil War era surgeons performed cranial trephination, a procedure which involved drilling a circular hole into the skull to relieve intracranial pressure after head wounds. Of the 220 operations performed by Union surgeons, 50 percent were successful. Today surgeons have an array of tools, equipment, and materials at their disposal to detect brain injury, including the life-saving titanium mesh which allows for bone-regrowth and does not interfere with MRIs (magnetic resonance imaging). Cross-sections of the brain on display revealed subarachnoid hematomas (bleeding of smaller vessels) and subdural hematomas (bleeding of larger vessels). Such injuries can occur from a single blow to the head or from an explosion. 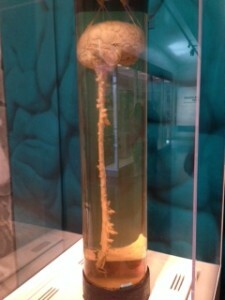 One fascinating specimen floating in a vertical cylinder was a brain connected to the spinal cord, dating back to 1935. It showed the complexity of the bundles of axons (nerve fibers) that supply information from the brain to torso, arms, and legs. Biomedical engineers developed devices and processes such as artificial kidneys used in dialysis, prosthetic limbs, and tissue engineering of the skin. 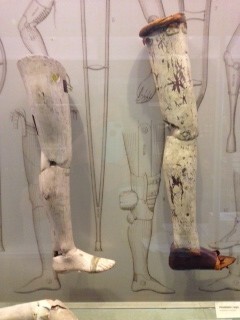 On display was a Drake artificial leg dating back to 1866 and a Kolff-Brigham artificial kidney. Manufactured by Edward Olson of Massachusetts, this artificial kidney could cleanse the blood of one or two patients daily, passing arterial blood through cellophane tubing wrapped around a drum, which rotated through a 100-liter chemical bath. 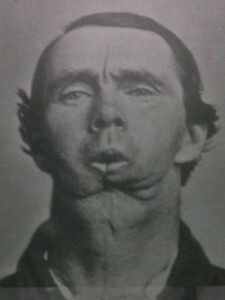 More than 45,000 Civil War soldiers from both sides survived amputations and were fitted with prosthetics. Many soldiers did not survive their bullet and shrapnel wounds unless their limbs were amputated. “More than 400,000 soldiers from both sides died from disease during the war, almost twice as many as were killed in action. Open latrines, unclean water, stifling tents and rotting foods turned crowded camps into breeding grounds for sickness.” Dysentery and childhood diseases such as chickenpox, measles, and mumps were deadly in those unsanitary conditions. Osteomyelitis (bone infections) and gangrene spread easily through hospitals. The Army Medical Museum had preserved by the end of the Civil War more than 4,000 skeletal specimens with various gunshot, blunt force, and sharp force injuries. Wet tissue specimens were also preserved in alcohol. Medical records with treatment and surgical procedures were also carefully catalogued, including drawings, photographs, letters, reports, and diaries of nurses. The data was compiled into a six-volume Medical and Surgical History of the War of the Rebellion. 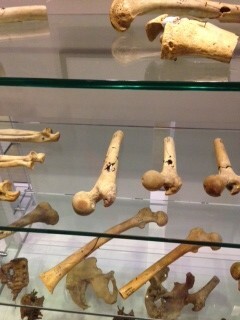 The archives and the specimens are still used in scientific studies today. 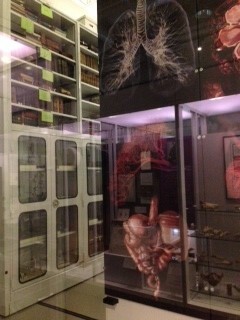 The museum holds the largest collection of pathological gross tissue in the world and some samples are quite rare. Microscopic sections of tissue, cells, or blood identify abnormalities, disease, and deformities. Among various microscopes dating from 1853 and 1881, the Zeiss microscope used by Walter Reed in 1898-1899 and the 1665 London microscope used by Robert Hooke of the Royal Society stand out. Robert Hooke wrote Micrographia and was the first person to use the word “cell” in microscopic structures. U.S. Army Major Water Reed (1851-1902) has saved countless lives through his research into the causes of typhoid and yellow fever and the discovery that yellow fever is transmitted by mosquitoes. Maj. Reed was the curator of the Army National Museum and professor of clinical microscopy at the Army Medical School (now the Walter Reed Institute of Research). Walter Reed General Hospital was founded in 1909 and remained the Army’s premier treatment center for more than a century until it was merged in 2011 with the National Naval Medical Center in Bethesda, Maryland. The merger formed Walter Reed National Military Medical Center. On my last museum visit at the Washington, D.C. location, I spoke with a couple of soldiers injured in Iraq who were recuperating and were taking a stroll on the grounds. 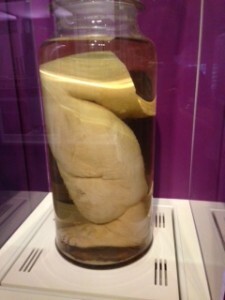 The most gruesome non-military specimen was the amputated leg of a 27-year old in 1894 who had Elephantiasis and lived with this leg for 12 years. In response to a parasite, the leg became inflamed and scar tissue formed which accumulated over time. Elephantiasis is still prevalent in some tropical areas today. One interesting display contained two bits of blackened cloth expectorated by a colonel 18 weeks after he had been shot in the chest when fragments of his uniform were lodged within his body. The bullet fragment extracted from Abraham Lincoln’s head post-mortem is barely visible under a tiny round glass container. Capt. Henry Wirz was arrested at the end of the war for crimes committed while commanding the Confederate prison at Camp Sumter in Andersonville, Georgia. During his watch, 13,000 of the 45,000 Union soldiers died in captivity from brutality. Wirz denied the charges by claiming a debilitating injury to his right arm. After his execution on November 10, 1865, an autopsy discovered that he had full use of his right arm. A hydrocephalic baby, conjoined twins, fetal skeletons, a cross-section of a black lung, a liver with cirrhosis, diseased kidneys, a kidney with scarlet fever, carcinomas in the kidney, spina bifida, a human hairball from the stomach, and a scrotum with Elephantiasis are some of the non-war medical specimens on display. Trauma Bay II in Balad, Iraq, located on a scarred concrete slab, had saved more lives between 2003-2007 than any other war theater hospital, with a survival rate of 98 percent, and served as a testing ground for innovative technologies that relieved pain and suffering for patients who were evacuated when stabilized. This floor is now preserved in the museum. Lt. Col. Chester Buckenmaier III pioneered the use of a peripheral nerve block while deployed at the Balad hospital. While the patient remained conscious, his goal was to manage pain, keeping a patient alert during a 5-hour flight. 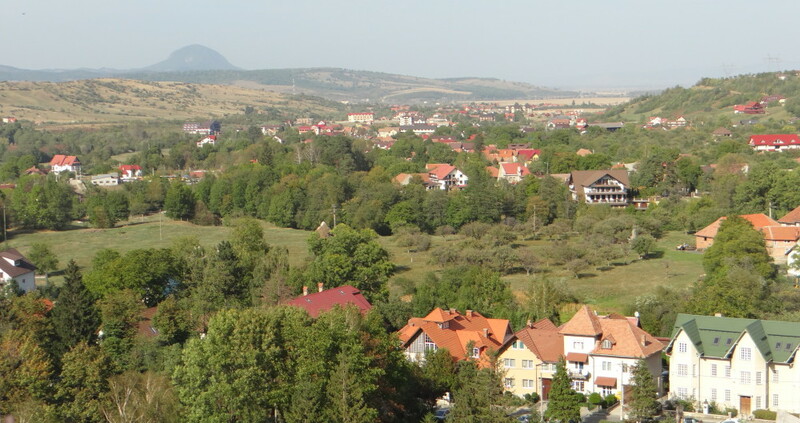 From September 2001 through September 2007, more than 44,000 severely wounded patients were flown from Balad to Landstuhl Regional Medical Center near Ramstein, Germany, within 24-72 hours after arriving at Balad. Instruments on display show the progression from wood and ivory to steel, the choice metal in the age of sterilization, and the sophistication of tools that developed to enable surgeons to perform more complex surgeries. Military medicine protected combatants against enemy weapons, infectious diseases (vaccinations against tropical diseases, drugs to fight malaria, typhoid, and dengue fever, starting with the Continental Army), psychological stresses, and environmental forces such as high altitudes and extreme hot and cold temperatures (preventing dehydration, altitude sickness). From the early strips of linen cloth or lint packing and protecting wounds, modern bandages are hemostatic, helping wounds to clot while protecting against infection. 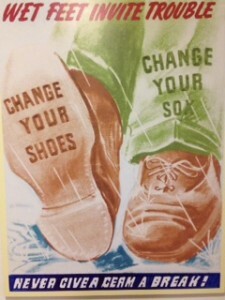 After WWI, rehab became part of military medicine. 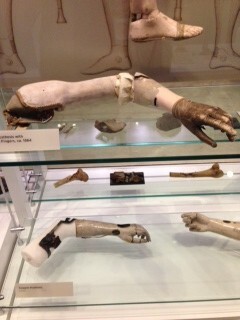 The primitive prostheses of mid-1800s were replaced by bionic limbs that replicate the functioning of the lost limbs. 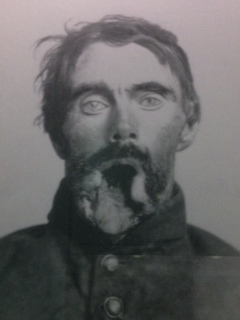 Thirty facial and skull reconstructions were documented during the Civil War such as suturing the soft tissues of eyelids, nose, and mouth. Private Carleton Burgan had his entire face reconstructed by Dr. Gurdon Buck in 1863 during a seven month period at New York City’s Hospital. A gangrenous ulcer on his tongue destroyed his upper mouth, palate, right check, and right eye. Doctors today at the 3-D Medical Applications Center at Walter Reed National Military Medical Center in Bethesda, Maryland, create 250-400 3-D anatomical models and custom implants annually. 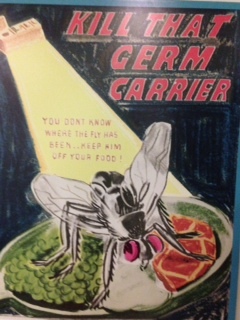 On a quick trip to the bathroom before departure, I discovered four WWII posters produced by the Army Medical Museum during its campaign to educate service members about personal hygiene, STDs, and infectious diseases. I left with a sense of disappointment that had nothing to do with the museum. Although I saw ample evidence of how well our servicemen are cared for on the battle field and immediately afterwards in surgery and rehab, I know how inadequately veterans are treated medically once they come home and retire, how rationed and often substandard their care is. Author’s Note: The data, photographs, and quotes used in this article can be found in the National Museum of Health and Medicine in Silver Springs, Maryland. This entry was posted in History and tagged archives, Civil War, history, medicine, military, National Museum of Health and Medicine, specimens, world wars by Admin. Bookmark the permalink.